Paradise Valley Arizona (PV) is a residential community in the foothills of Camelback Mountain, Mummy Mountain and the Phoenix Preserves. There are approximately 7,000 homes and a population just under 13,000 residents. The Township was incorporated in 1961, but shares the Scottsdale Post Office, and several residential utilities and services with both Scottsdale and Phoenix. The initial 1 acre minimum lot requirement, coupled with inconsistencies of building in the hillside terrain, has created a beautiful architectural diversity. 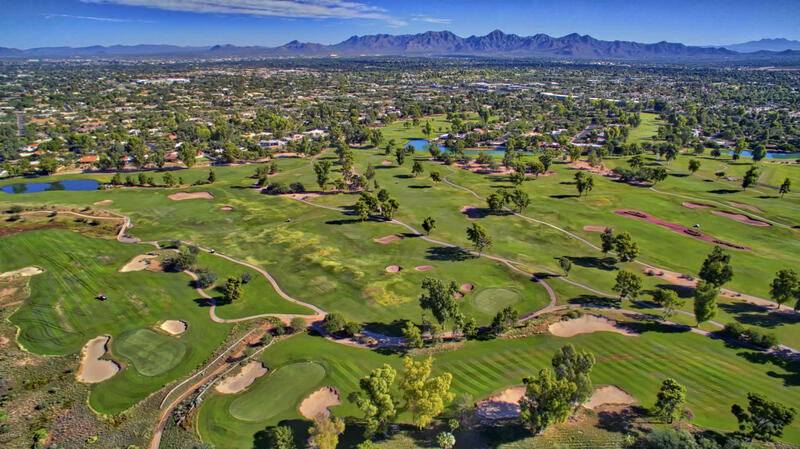 Just 15 minutes from Sky Harbor International Airport, PV is bordered by Scottsdale and Phoenix, There are very few commercial sites, limited to a handful of Phoenix Metro Valley's most exclusive resorts, many Golf Courses, Top Restaurants, and the Paradise Valley and Camelback Country Clubs. Residents enjoy hiking and biking, and the PVPD are strict with speed enforcement due to its central location in the heart of the 5th largest metropolitan density in the nation. PV has many secure gated communities which have included common areas as a portion of the aggregate land density requirement to this 1-acre minimum. A typical resident's drive circle is about five miles, which can include work, great schools, fabulous restaurants and Arizona's best shopping. Settlement began here just after World War II. The homes were modest in size and style and they usually occupied 1 to 5 acres. In the late 1950s, Phoenix and Scottsdale were looking to expand their respective boundaries, so residents formed a "Citizens Committee for the Incorporation of the Town of Paradise Valley, Arizona" with the main goals to keep zoning to a one house per acre minimum; to keep the area entirely residential; and to keep government regulation to a minimum. Many of these homes included incredible estates of some of this Country and State's founding families, vacationing politicians, dignitaries and celebrities. Several have been preserved and are now resorts and/or residences. Now arguably one of the most exclusive communities in the state, PV is nestled at the base of some of the most beautiful hiking mountains, and rolling hills to bike and run, yet in the middle of the fifth largest metropolitan city in the United States. With over 300 days of sunshine a year (yes, the hiking is fabulous in the summer), there is a large percentage of "snow birds" or secondary or thirsary residences. PV is also known for its privacy. Developments include the 2016 approval of a new Ritz-Carlton Paradise Valley, the brands first development in over a decade. This included an adjacent shopping district touted to be the most exclusive in the Western United States, “Rodeo Drive without the Drive." PV's most well-known landmarks and hillside residences are located on Camelback, Mummy and the Phoenix Mountain Preserves where there is a no-dynamite policy, and pads can take upwards of 3 years to hand chisel. Existing resorts include the Sanctuary, Montelucia, Hermosa Inn, Camelback Inn, El Charro, and the Paradise Valley Country Club. Homes here sell at square footage prices ranging from around $300 to well over $1,000, with an average listing price currently just over $2M. The public schools are highly and there is an abundance of private and charter schools in the Town or in proximity. Well known celebrities include David Spade, who grew up in McCormick Ranch, Emma Stone who lived in Paradise Valley, Kurt Warner who sold his PV home and now lives in Scottsdale, Clive Cussler the author is a long time PV resident, Robert Mitchum had a home in PV, Dan Quayle graduated from Kiva Elementary in PV and he and his son each have homes in PV, swimmer Michael Phelps has a large home here, and others include Alice Cooper, Bret Michaels, Bill Keane, Mike Tyson.